So there it was, a beautiful box of artisan chocolate champagne truffles. Sounds good right? Right. The only trouble is, I don’t really like truffles, I really don’t like chocolate liquors and to make it worse I don’t really like Champagne that much either! (I know, I know, how I can I not like Champagne, well it gives me a head ache and I can’t bare Champagne breath). I put these kind of chocolates in a category with Tiramisu and Sherry Trifle ie. gag city! This was a present from my husband, I wasn’t annoyed, but it did make me chuckle. So I asked him what made him choose them. He started laughing…. ‘I PANICKED! !’ he said. I knew he had. So I said half-joking ‘that’s it I’m making a list of everything I like’, and he said ‘Pleeeeease do!’. But the more I thought about it the better I thought the idea was. Lets prevent those arguments years down the line of ‘Don’t you even know me? !’ or the classic ”What would you like for your birthday?…..”Oh nothing darling don’t make a fuss”….which we all know means MAKE A FUSS! Or do we stay quiet and secretly seethe year after year as the truffle boxes stack up? And it goes both ways, guys and girls alike should do this. Have your favourite things on there, flowers, food, brands, treats, fragrance, bra size if you really want, even add your favourite charity they can donate to! It means that at every Christmas, Valentines, Anniversary and Birthday, if you are pulling your hair out over what to buy your other half then you can go back to the mood board for inspiration. 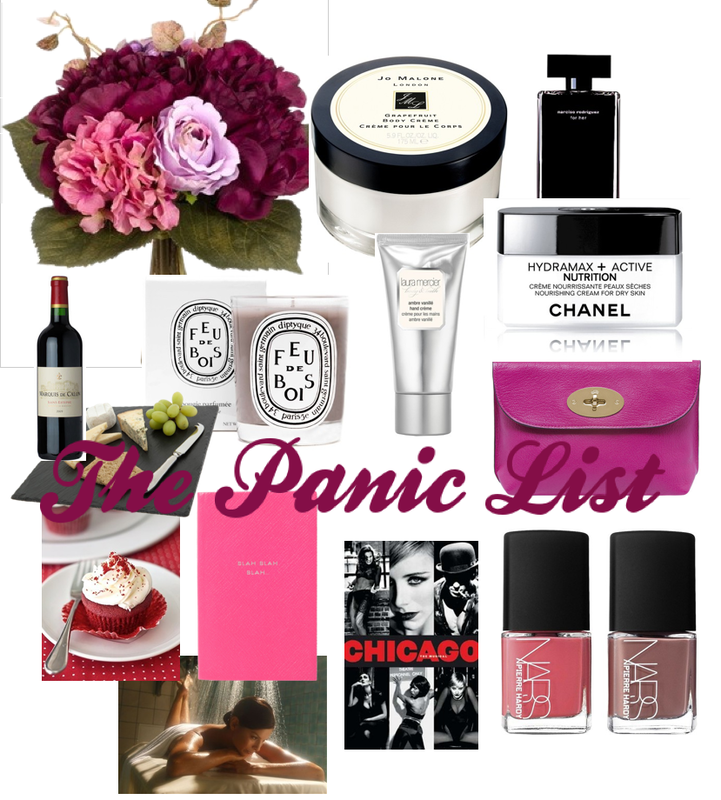 Consult ‘The Panic List’. So here’s mine, if you like it, use it. If not start your own. Save cuttings from magazines or collect all the site links in an email. You can update it all the time. Jo Malone – Anything from this range is beautiful and smells amazing. Indulgent treats ranging from £15 to around £300 so there’s something for all budgets. Fragrance – Narciso Rodriguez from all good department stores. Laura Mercier – Gorgeous creams and make up available at Space NK and House of Frazer. Mulberry – I have loved this brand since I was a young girl, classic, stylish, British and luxurious. You can find it in leading department stores. Yes teh handbags are expensive, so this one is for very special birthdays! However, you can start small by going for little treats like a key ring. My top tip is to head to Bicester Village if you want to find one at a bargain price. Nars – Most girls like to make their nails puuurrrrdy so a treat of posh polish is always a winner. Bright colours for summer, dark for winter, simples. Smythson – Us girlies love stationary, I’m guessing it comes from starting a new school year and getting lovely new notebooks and pencils! Smythson is a different level of luxury though. Spas – Who doesn’t want to be pampered? You can’t go wrong with a spa voucher, then he/she can choose the treatment. Red Velvet Cake – This is my personal favourite cake. We had red velvet from the Hummingbird Bakery for our wedding and it’s amazing. Even just one cupcake can be a lovely treat for your other half. Wine and Cheese – If you love a particular type of wine or cheese or any other food or drink then make sure he/she knows. So if an evening of cheese and wine is something you would love then add it to your list. For the record I’m partial to a Malbec or Pinot Noir. I love a good cheese board but I don’t do anything with mould! Diptyque – These are the most amazing smelling candles, and they should be for £40. This is one of those items where cheaper doesn’t cut it, Diptyque really is a special treat. I would like to appreciate the effort made by the vendor for delivery of Flowers on the occasion of my friend’s marriage. I will recommend the website http://www.flowersonlinedelivery.co.uk for giving good vendor for getting my friends happy. My good wishes to http://www.flowersonlinedelivery.co.uk.